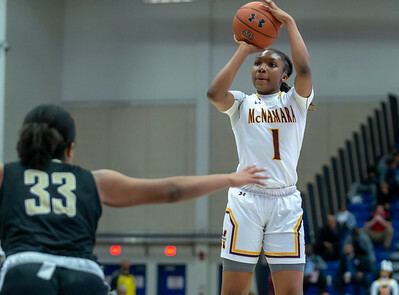 The Bishop McNamara High School girls basketball team defeated Paul VI in the WCAC Girls Basketball Tournament semifinals on Feb. 24. Photo by Michael Smith/The Prince George's Sentinel. 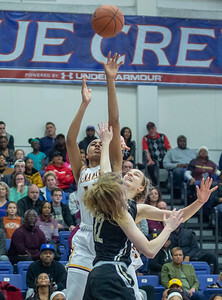 Washington, DC, Sunday, February 24, 2019: Madison Scott (24) is fouled in the act of shooting during a WCAC Girl's Semi-Final tournament game between Paul VI and Bishop McNamara held at Bender Arena in Washington, DC. (Michael R. Smith/The Prince George's Sentinel). 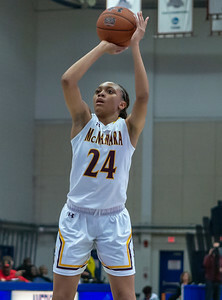 Washington, DC, Sunday, February 24, 2019: Madison Scott (24) takes a jumpshot during a WCAC Girl's Semi-Final tournament game between Paul VI and Bishop McNamara held at Bender Arena in Washington, DC. (Michael R. Smith/The Prince George's Sentinel). 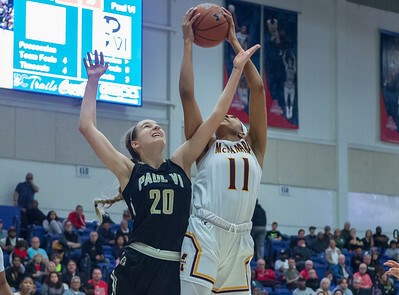 Washington, DC, Sunday, February 24, 2019: Aliyah MAtharu (2) of McNamara drops off a pass to Kayla Thomas (22) during a WCAC Girl's Semi-Final tournament game between Paul VI and Bishop McNamara held at Bender Arena in Washington, DC. (Michael R. Smith/The Prince George's Sentinel). 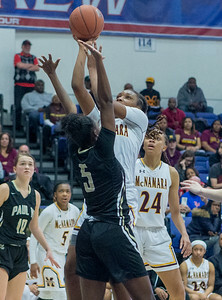 Washington, DC, Sunday, February 24, 2019: Jakia Brown-Turner (11) of McNamara grabs a rebound over Lee Volker (20) of Paul VI during a WCAC Girl's Semi-Final tournament game between Paul VI and Bishop McNamara held at Bender Arena in Washington, DC. (Michael R. Smith/The Prince George's Sentinel). 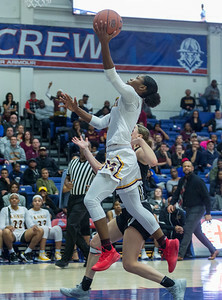 Washington, DC, Sunday, February 24, 2019: Jakia Brown-Turner (11) of McNamara goes up strong for a rebound during a WCAC Girl's Semi-Final tournament game between Paul VI and Bishop McNamara held at Bender Arena in Washington, DC. (Michael R. Smith/The Prince George's Sentinel). 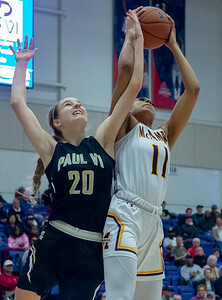 Washington, DC, Sunday, February 24, 2019: Madison Scott (24) of McNamara takes a shot over Taylor Cotter (5) during a WCAC Girl's Semi-Final tournament game between Paul VI and Bishop McNamara held at Bender Arena in Washington, DC. (Michael R. Smith/The Prince George's Sentinel). 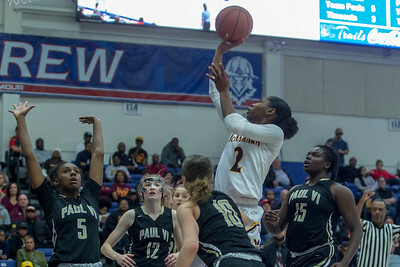 Washington, DC, Sunday, February 24, 2019: Jakia-Brown Turner (11) puts up a layup during a WCAC Girl's Semi-Final tournament game between Paul VI and Bishop McNamara held at Bender Arena in Washington, DC. (Michael R. Smith/The Prince George's Sentinel). 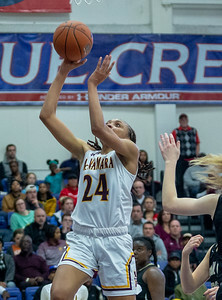 Washington, DC, Sunday, February 24, 2019: Liatu King (1) of McNamara takes a shot during a WCAC Girl's Semi-Final tournament game between Paul VI and Bishop McNamara held at Bender Arena in Washington, DC. (Michael R. Smith/The Prince George's Sentinel). 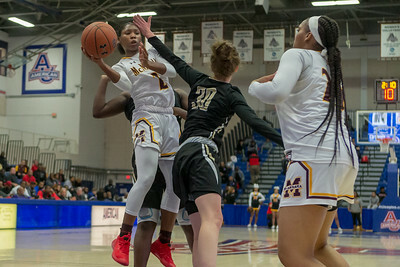 Washington, DC, Sunday, February 24, 2019: Aliyah Matharu (2) of McNamara slips past Jaelyn Talley (33) for a layup during a WCAC Girl's Semi-Final tournament game between Paul VI and Bishop McNamara held at Bender Arena in Washington, DC. (Michael R. Smith/The Prince George's Sentinel). Washington, DC, Sunday, February 24, 2019: Madison Scott (24) scores on a layup during a WCAC Girl's Semi-Final tournament game between Paul VI and Bishop McNamara held at Bender Arena in Washington, DC. (Michael R. Smith/The Prince George's Sentinel). 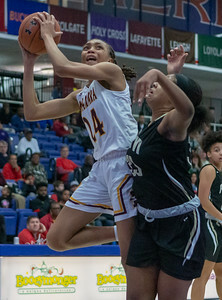 Washington, DC, Sunday, February 24, 2019: Aliyah Matharu (2) of Bishop McNamara puts ups a layup during a WCAC Girl's Semi-Final tournament game between Paul VI and Bishop McNamara held at Bender Arena in Washington, DC. (Michael R. Smith/The Prince George's Sentinel). 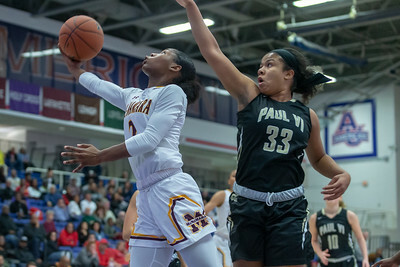 Washington, DC, Sunday, February 24, 2019: Jakia Brown-Turner (11) of McNamara is fouled while making a shot in the 4th quarter during a WCAC Girl's Semi-Final tournament game between Paul VI and Bishop McNamara held at Bender Arena in Washington, DC. (Michael R. Smith/The Prince George's Sentinel). 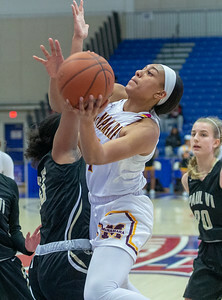 Washington, DC, Sunday, February 24, 2019: Aliyah Matharu (2) scored 18 points during a WCAC Girl's Semi-Final tournament game between Paul VI and Bishop McNamara held at Bender Arena in Washington, DC. (Michael R. Smith/The Prince George's Sentinel).